Hi everyone! 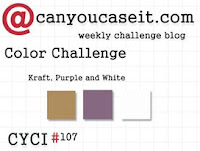 I'm over at Can You Case It with a card for their Color Challenge this week! Here's the banner for the Challenge if you want to head over and link up one of your own! For this one I wanted to use a stamp set that I love but hadn't ink up before.. Heartfelt Sympathy. I just love the big font on these awesome sentiments. I decided to keep mine pretty simple because that gorgeous sentiment doesn't need a lot. I just added a few more flowers on both sides. 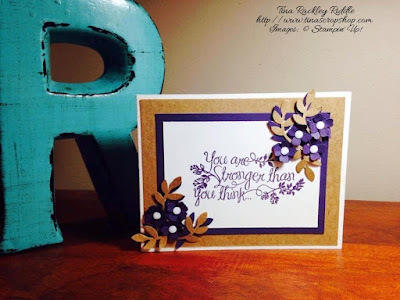 I really loved the color combination of White, Kraft and Purple! Thanks Eva! Fab colors on this challenge! Hi Tina! This is just so beautiful, I saw it in the gallery and had to stop by. I love the sentiment for what it says and that nice big font. And pairing it with the floral corners is perfect. Beautiful take on the challenge! Thanks so much Dawn! This was a fun one!